Former Surgeon General Joycelyn Elders has been a pioneering and historic political figure in many regards. The first African American Surgeon General made many headlines during her tenure under the Bill Clinton Administration, as she was certainly one to speak her mind, even if the rest of the world wasn’t quite ready to hear it. While many political figures and policymakers play it safe, Elders was calling upon the United States government to rethink the Drug War back in 1993, three years before California had even passed the nation’s first medical cannabis law. The momentum for cannabis law reform is so great today, with a strong majority of Americans supporting marijuana legalization and a supermajority supporting medical use, that sometimes it is hard for many advocates, especially those new to the movement, to remember a time before any state had passed a medical marijuana law. However, there was a time when we needed brave public figures to take courageous stands against the Drug War and one of those people was Joycelyn Elders. It would have been nice if President Clinton and his administration officials had offered more support for Elders during her tenure, but not every influential policymaker is as political courageous as Elders. 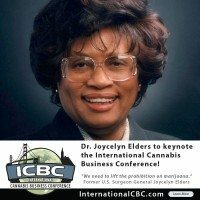 Dr. Joycelyn Elders will be making yet another historic stand, this time as a keynote speaker at the International Cannabis Business Conference (ICBC) in San Francisco on February 13-14th. The timing of Elders’ keynote address is crucial when the current Surgeon General Vivek Murthy has recently called for a review of our nation’s drug laws and California and several other states look to improve their marijuana laws on the 2016 ballot. Attendees of the ICBC will hear from Elders and many other great speakers, such as renowned blogger Andrew Sullivan, cannabis icon Tommy Chong and Arjan Roskam, founder of the Green House Coffeeshops and Green House Seed Company in Amsterdam. As one of the organizers of this conference, I am extremely excited to meet and hear from Dr. Elders. The ICBC was already going to be a great conference, and Elders keynote makes the ICBC as truly historic event. Former U.S. Surgeon General Joycelyn Elders will headline the International Cannabis Business Conference on Feb. 13 and 14 in downtown San Francisco. She’ll be joined by Andrew Sullivan, a prominent author and blogger; Tommy Chong, star of the Cheech & Chong movies; Arjan Roskam, who started the “Strain Hunters” documentary series; and Anthony Johnson, the executive director of Oregon’s successful campaign to legalize marijuana. “Business and Politics” is the theme of the conference, which comes as several legalization initiatives vie for a spot on the state’s November ballot. California has a $1.3 billion marijuana market, the largest in the U.S., and legal marijuana is the fastest growing industry in the country, according to The ArcView Group, a cannabis industry investment and research firm. Newly-passed medical regulations are transforming the state’s industry, and San Francisco has begun crafting recreational rules in anticipation of full legalization. Unlike consumer-focused conferences like the Cannabis Cup, the International Cannabis Business Conference focuses on business strategy and influencers. It’s designed to be a crash course for entrepreneurs who want to grow business not only in California but also nationally and internationally. Many of the speakers are from outside the country. Panel topics include legal, banking and tax issues; fundraising and marketing; and California’s new regulations. Earlybird tickets cost $499, and the event is likely to sell out. Elders, the conference headliner, was the first African American appointed as Surgeon General of the United States. She came out in support of marijuana legalization in 2010, long before 58 percent of Americans supported it. Dale Sky Jones Dale co-founded the National Cannabis Industry Association and Californians to Regulate Medical Marijuana. She’s now working at Oaksterdam University to train people within the cannabis industry. Raul Del Pino leads project direction and management for Spannabis, Europe’s largest cannabis fair and expo. Lukas Behal is founder and managing director at Cannafest s.r.o, the international trade show of cannabis and medical herbs. Philippe Lucas is vice president of patient advocacy at Tilray, a federally authorized medical cannabis production, research and distribution company based in Nanaimo, BC. Debby Goldsberry has been a leader in the medical and adult use marijuana industry for over 25 years. She co-founded the Berkeley Patients Group medical cannabis collective in 1999 and is currently executive director of Magnolia Wellness Collective. Zeta Ceti has spent the last 20 years in the California medical cannabis industry as a master cultivator, patient advocate and entrepreneur. In 2012 he founded Green Rush Consulting. Steve Bloom is editor-in-chief of Freedom Leaf magazine. He also publishes and edits CelebStoner.com, a leading source for marijuana and celebrity news. Ngaio Bealum is one of the premiere cannabis comics in the United States. He has appeared on Comedy Central, BET and MTV. Ed Rosenthal is a leading expert on marijuana cultivation. In his more than forty years as the “guru of ganja,” he has written or edited more than a dozen books about marijuana cultivation and social policy. Amanda Reiman is the Manager of Marijuana Law and Policy for the Drug Policy Alliance. She manages the organization’s marijuana reform work nationally and internationally. Henry Wykowski is a former prosecutor in the U.S. Justice Department and has prosecuted some of the U.S. government’s largest and most high profile tax evasion cases. Today, he is the leading cannabis industry tax attorney. David Hua is the CEO and co-founder of Meadow, which delivers cannabis-based medicines. Troy Dayton co-founded The ArcView Group, a premier investment group and market research firm. He currently serves as CEO. Chris Conrad is an internationally respected expert on industrial hemp and marijuana. His newest book is The Newbie’s Guide to Cannabis and the Industry. Ben Larson is the co-founder and managing partner of Gateway. He helps aspiring entrepreneurs achieve their potential as great business leaders. Prior to launching Gateway, Ben managed global operations for Founder Institute, the world’s largest entrepreneur training and startup launch program. Todd McCormick battled cancer throughout childhood and has dedicated his life to the study and research of cannabis. He was an editor of The Emperor Wears No Clothes. Evan Horowitz is the founder of WeedClub.com, 420 on Twitter, and is the host of @420 Pitch by WeedClub.